Our vintage-style distressed gray Biscuitville hat with trendy patch makes it clear that your love of biscuits is nothing new. 100% cotton front panel and visor with stitched on logo patch. 100% nylon mesh back panel. 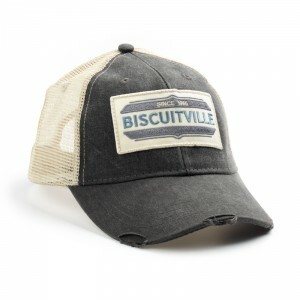 Features a distressed torn visor with four rows of stitching on bill. Sewn eyelets, cotton twill sweatband, and plastic tab back closure.